JUNE 2017 UPDATE : JIM DE HOOP IS NO LONGER WITH THE CITY OF VANCOUVER. Jim Dehoop is infatuated with this younger woman, even though she denied a homeless advocate food. 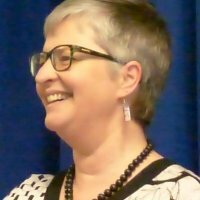 Some of you might not be aware that Johnny Zakharia, the founder of BC Homeless Advocacy, and has helped 1000’s of homeless, and an advocate for the poor and marginalized, recently emailed Rennie Keates (who taxpayers pay her over 120k a year) regarding the Gathering Place Community Center frequently not making enough breakfast for the homeless, which was causing the homeless to suffer and go hungry. However. Instead of Rennie Keates thanking him for his feedback, Rennie Keates became very hostile, abusive, and threatening. Rennie Keates even lied and denied the serious problem of homeless suffering hunger and distress. While the taxpayers are paying her over 120k a year. Johnny Zakharia and the homeless thought that Rennie Keates would show some kindness to those who bring serious issues to her attention. We even waited a few months but the problem become worse. Even the Gathering Place staff and volunteers witnessed the Gathering Place running out of breakfast within 20 minutes of opening. In August 2016, Johnny Zakharia again sent an email to Rennie Keates regarding the homeless suffering hunger and distress again. This time Rennie Keates denied and lied and refused to even thank the advocate for his concern. Instead Rennie Keates showed her malice and megalomaniac personality and decided to ban the homeless advocate from even eating a low-income meal just because he criticized her via an email. Not even in person, but via an email. After that then Johnny Zakharia contacted Jim De Hoop who is the director of Social Development for the city of Vancouver regarding Johnny being blocked from eating at the Gathering Place only because he criticized the hostile and hateful Rennie Keates (directory of Gathering Place). Not only Jim De Hoop did nothing, but even supported the extortion, malice, and abuse of power. Mr. De Hoop refused to meet with the homeless advocate, when the homeless advocated requested the he and Rennie Keates meet with him. Which was a very reasonable request. What happened to the separation of church and state? Or does Jim De Hoop suffer some delusional infatuation with her? 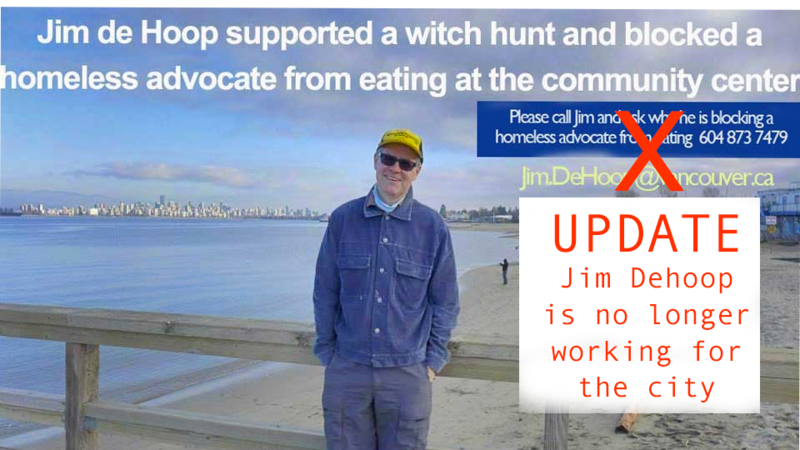 Mr. De Hoop was not shocked that a low-income homeless advocate was blocked from being allowed to EAT because he criticized Jim’s Goddess (Rennie Keates) through an email. is a mental condition in which a person has a long-term pattern of manipulating, exploiting, or violating the rights of others. This behavior is often criminal. When one denies a low-income man the right to eat that makes it even more psychotic. Any reasonable citizen would agree.